Happy Monday, blog friends!! I hope that your Easter weekend was fabulous! 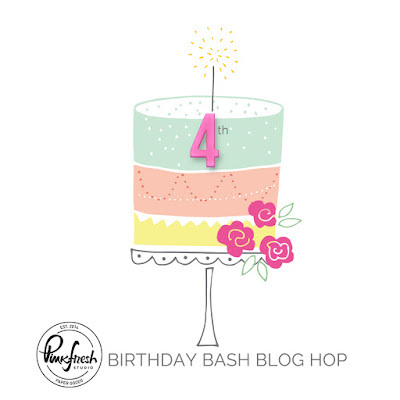 Today I am celebrating ANOTHER industry 4th birthday...I told you last week that this seems to be the year of the 4th Birthday Bash! Today Pinkfresh Studio is celebrating it's 4th birthday, and we are having a HUGE party! I'm officially proclaiming it Champagne Monday, so break out the bubbly & put on your party hats, because we have SO much in store for you today! We will have 2 giveaways on Instagram - one on our feed, and the other via IG Stories. So, be sure to follow us if you aren't already! And lastly, we will also have a Facebook giveaway of a prize package from the gorgeous Be You collection! So, make sure you like us on Facebook as well! To start, I created an A2 card from heavyweight black cardstock, then set aside. Next I cut two blocks of heavyweight white cardstock slightly smaller, and set one aside. 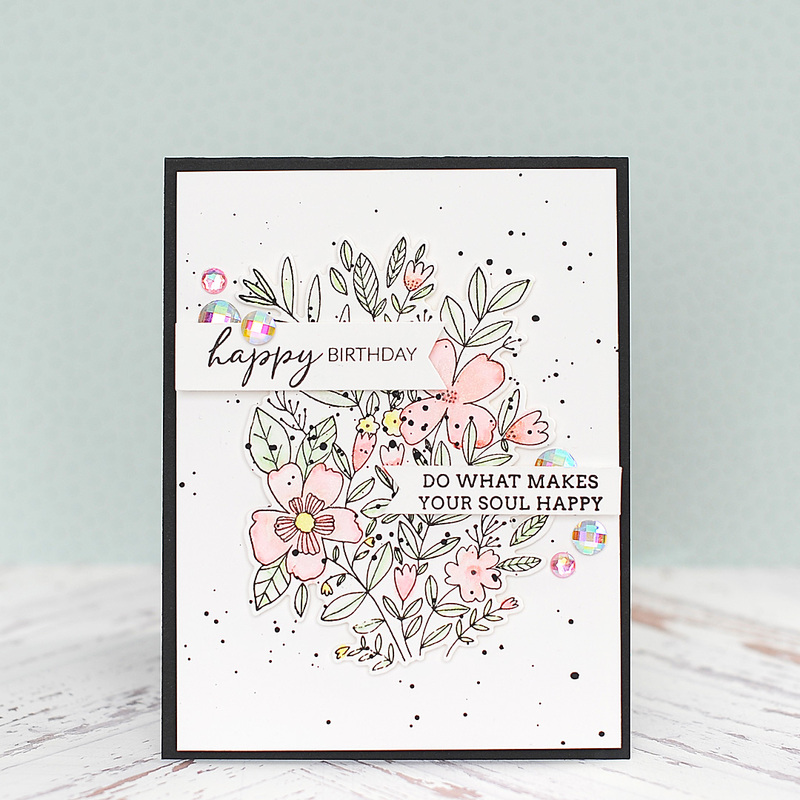 Then I stamped the flowers from the Fleur 1 stamp set to one of the white blocks in onyx black Versafine ink. I hit it with my heat gun for a few seconds just to make sure the ink set up. Next I watercolored the flowers with my Zig clean color real markers and a size 2 watercolor brush. I purposely chose to not use watercolor paper, as I wasn't using a ton of water on the stamped images and I wanted the water to soak in quickly. Once dry, I added some shimmer to the flowers with my Wink of Stella pen and then cut out the flowers with the coordinating Fleur 1 diecuts. Next I mounted the diecut flowers to the white cardstock block I had set aside, and flicked it with black paint splatters. I use a set of watercolor cakes to do this, and it has always worked really well for me! There are a lot of ways to add paint splatters to your cards, so chose your favorite. And If paint splatters aren't your thing, just leave them off and the card will still be super beautiful! Once the paint splatters were dry, I mounted the entire block to the card base using foam in order to give it some nice dimension. Next I stamped the two sentiments from the Word Series Happy & Pause for Applause stamp sets to white cardstock strips. I cut the banner edges as shown, then mounted them to the card front with foam dots. 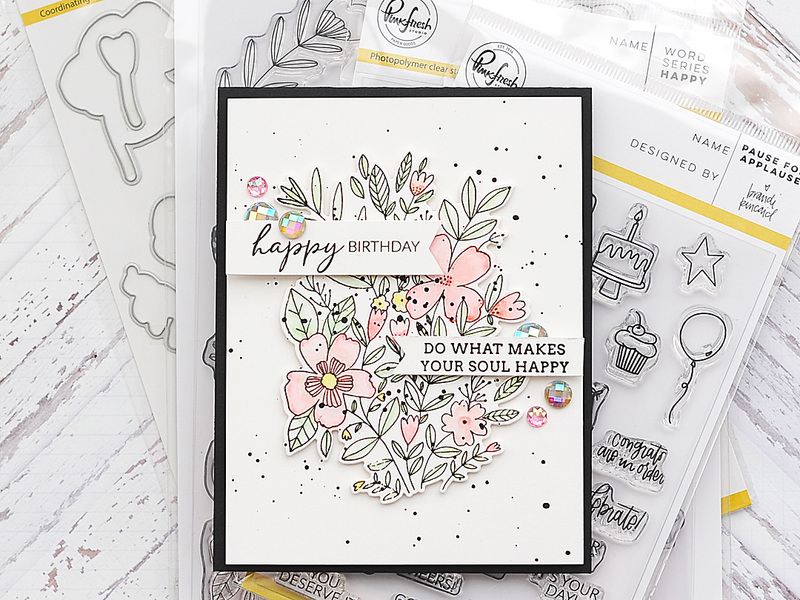 The Pause for Applause stamp set is technically a planner stamp set, but it has so many GREAT birthday options in it. 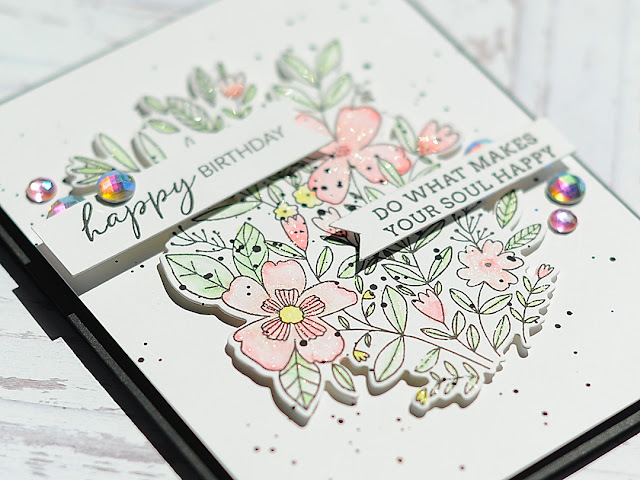 You will love it for your cardmaking as well! The final step to creating this card was accenting it with my signature jewels tucked here & there! I love adding sentiment strips for this very reason - I can really tuck them where I want them. Well, that is my card for you today! 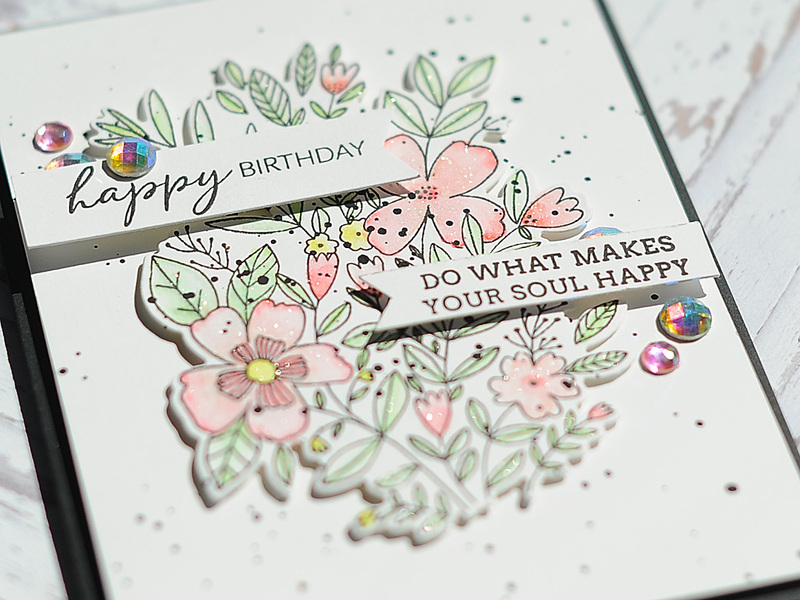 I hope that you enjoyed it, and realized how fun and easy it is to mix & match Pinkfresh Studio stamps in order to create a perfect sentiment. Our products really are so versatile! How about we get to the blog hop? Are you ready for some hopping? Here is the blog hop list you need! As I mentioned above, we all have either a $40 giftcard or $40 in scrapbooking products as giveaways on our blog posts! 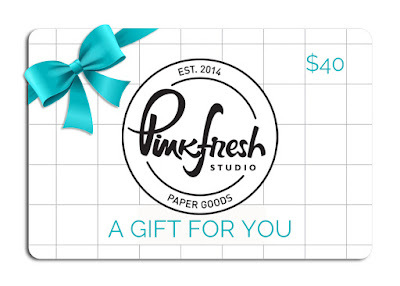 AND...there is a $100 giftcard giveaway on the Pinkfresh Blog, so don't forget to leave a comment there as well! I have a $40 gift certificate to give away! All you have to do is leave a comment on this blog post by Monday, April 9th at 6am PST. We will announce all the winners on the Pinkfresh Studio blog that afternoon! My goodness...I can't wait to sit down with a cup of coffee & check out all of the amazing creations to be seen along the hop! Lea, this is wonderful! Love your coloring! 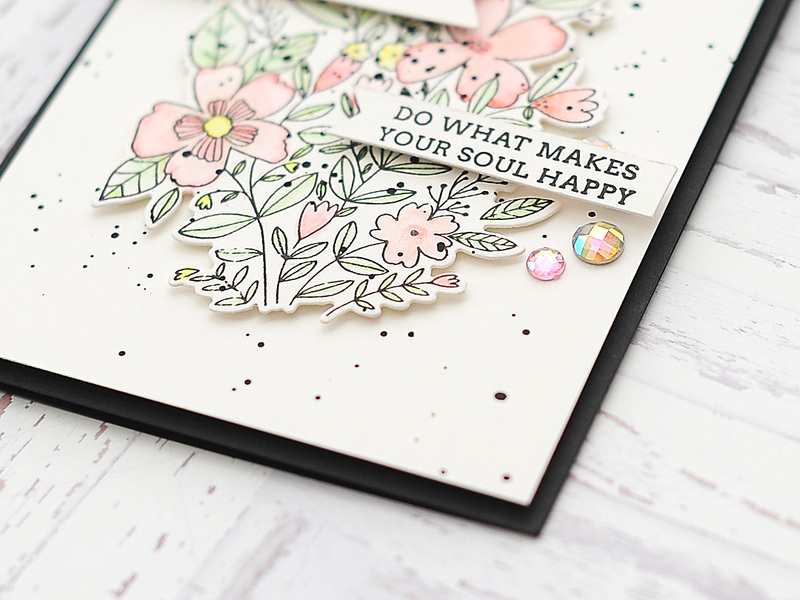 Love the pastels on the black card base! Great job on the watercolor. Just beautiful! I love all the layers! I love your style! I followed on IG. This card is so pretty. And clearly I need to take a look at some N& T sets... the sentiments I'm seeing are just amazing and perfect. Pretty card. Love that you used the Zigs and in the pastel colors. Very pretty. Your design is fresh, light, and lovely . Perfect for this time of year. The subtle touches of color are so "springy"! Just lovely design! I love your card! Simple but fabulous at the same time. Love the colors you used. Thanks for sharing and have a wonderful week. I love the simple yet very beautiful water-colouring. 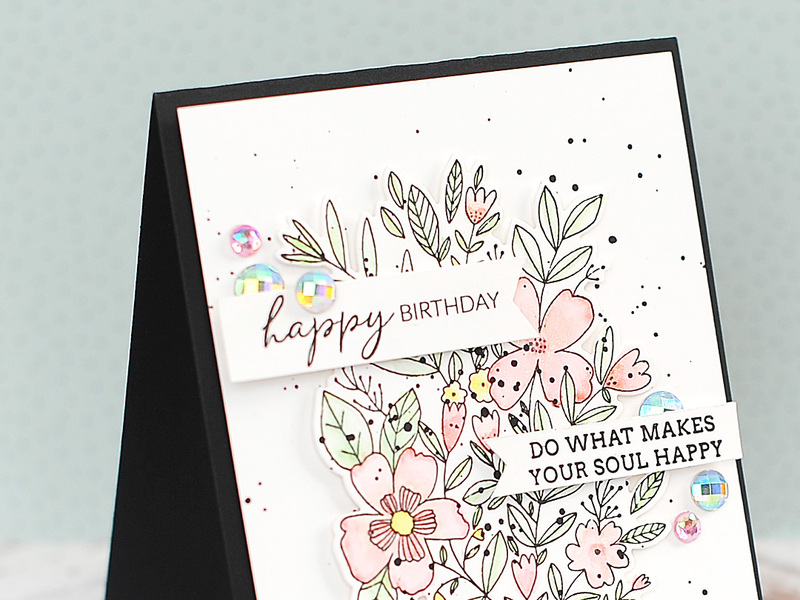 Lovely pastel colors and those black splatters-great combo! I enjoy every card you create. Your card is a touch of spring which is desperately needed in my neck of the woods. Your card is beautiful ! I love the soft colors. I love this card. 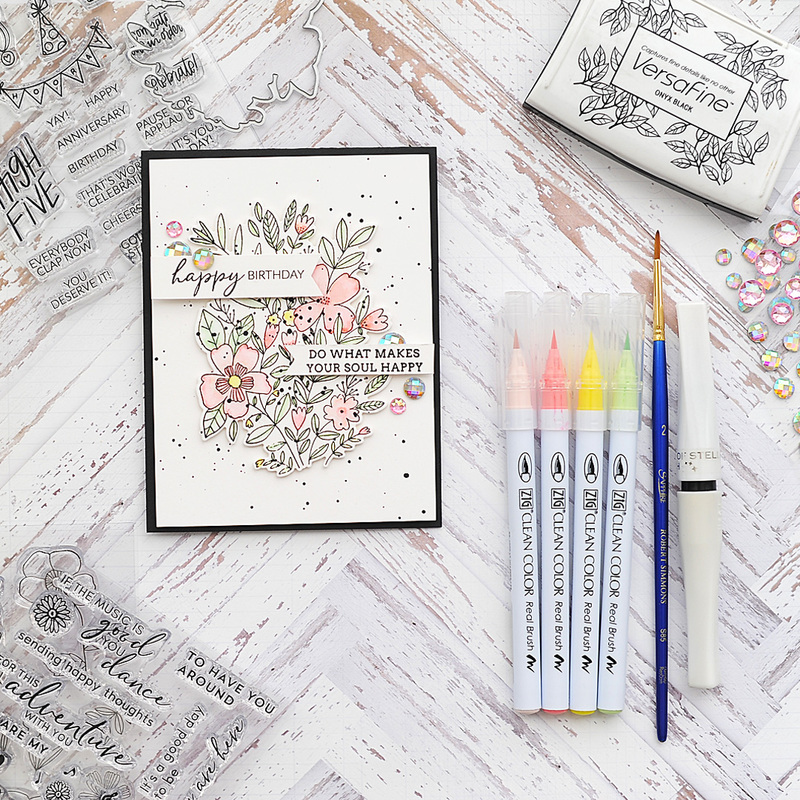 I have recently started creating my cards using watercolor and micron fine tip pens to achieve the illustrated look and this card fits my style completely! Thanks so much for sharing and for a chance to win in this hop. Stunning card. I love the soft pastel colors. So soft and pretty. Beautiful work! Oh, isn't that sentiment wonderful? Your card is do soft and feminine. 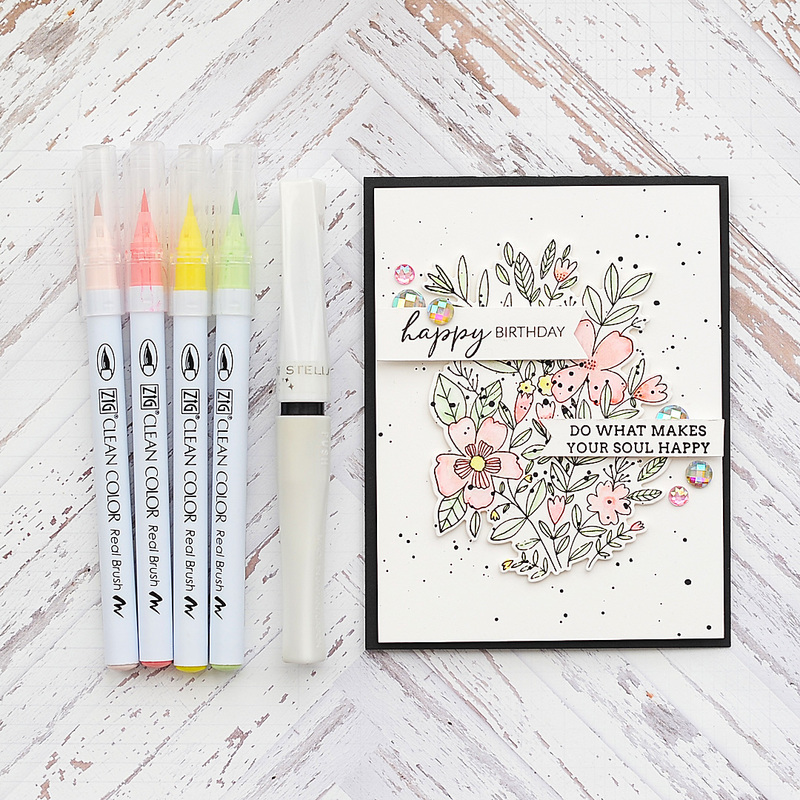 Beautifully watercolored card, love this! Beautiful floral card! I like the soft touches of colors and the irresescent accents. Lovely card and loved your coloring. Thank you for sharing tips on color splatters and photography. This card is gorgeous! I love this stamp set! It’s so soft and springy! So very pretty. I love the colors. look and the whole design. Gorgeous. Wow this is soooooo beautiful, love the softly color floral image!! Very pretty--love the soft colors. I absolutely love this card! Well done! Beautiful card. I love the style, the soft coloring, and the sentiment is wonderful. Oh, I love the soft coloring and that awesome sentiment! Wow, very soft pretty card . Love your designs. 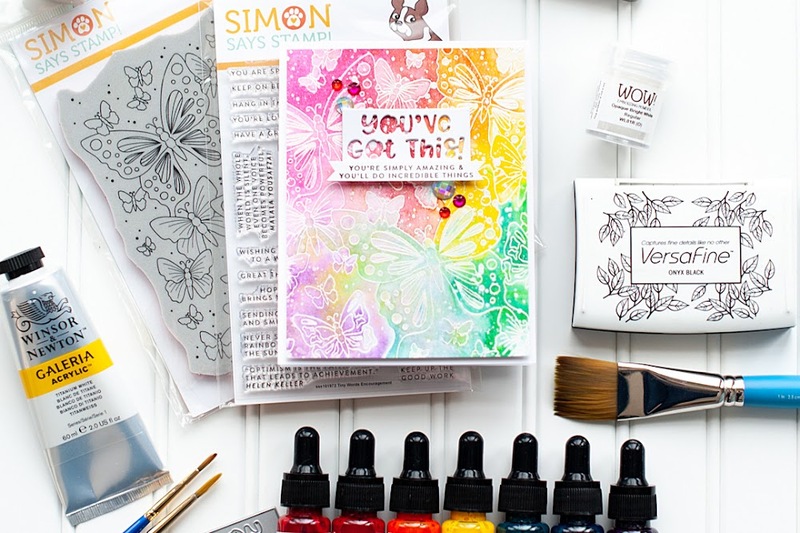 Beautiful and spring like colors, awesome Zig watercoloring. Your delicate card is absolutely my preferred! Thanks for the opportunity to win and happy birthday PFS! Gorgeous card! So light, airy and delicate. Love it! Beautiful card and excellent description of the process you used in creating this card! Well done! I'm in love with this type of cards. Clean and simple but with a lot of work behind . Such a pretty card with soft colors!!! Love those soft colors with the bold black! What a beautiful card - the colors are gorgeous! Beautiful, love the soft colors! So pretty. Love the flowers and soft colors. Amazing card! I love the colors, splatters, bling - perfect balance! I.love.your.card! I'm going to have to give this design a try! Super pretty and soft and I love the splatters! OMG, Lea, your card is stunning! 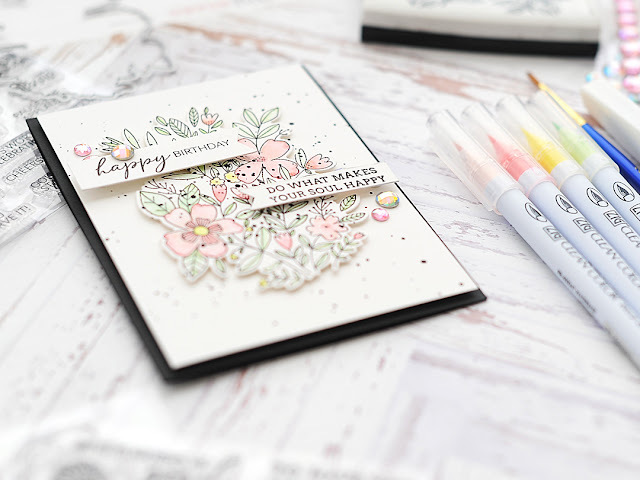 I adore how you watercolored the flowers is those beautiful pastel colors! 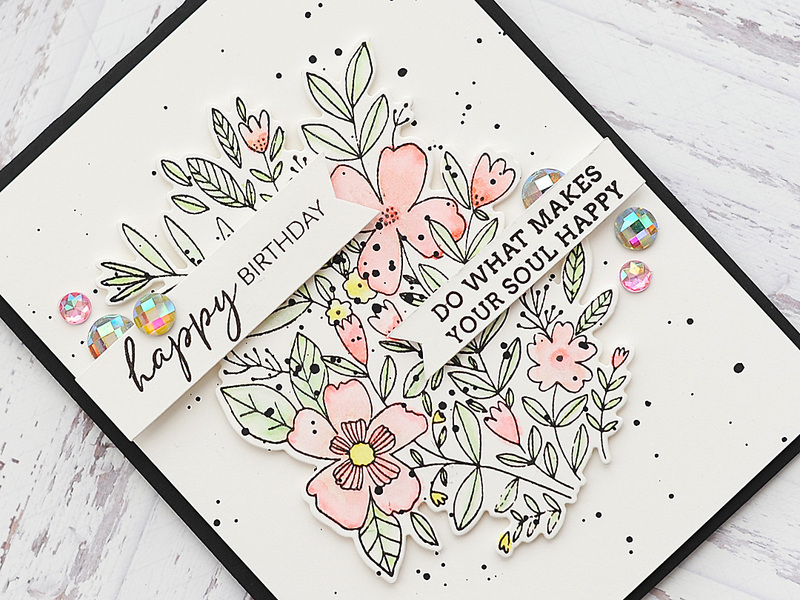 And, those black splatters and trim around the edges really makes those flowers stand out!! I have one question....what are watercolor cakes? You said you used them to make your splatters and I'd love to know what that is. Thanks!! 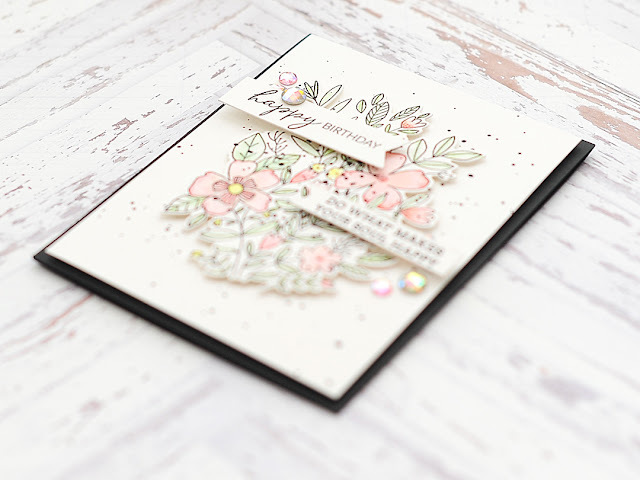 So soft & delicate.......simply stunning card! Absolutely beautiful!! Love the background and those flowers are amazing! Lea, your card is stunning! I love the soft colors with the striking black. Beautiful! I love the bold black lines and spatters with the soft watercolors. This is one of my favorite cards on the hop. Love the soft colors. So springy. Your card is just beautiful. I just love it! 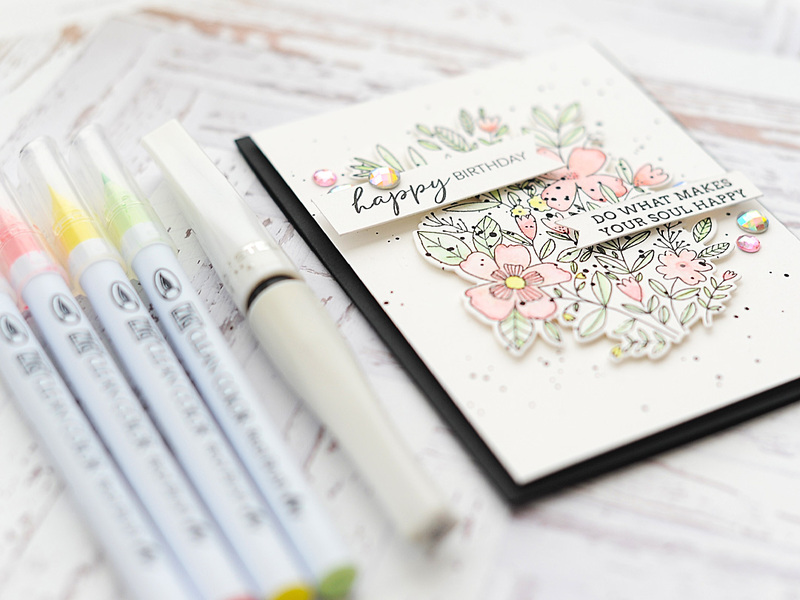 The soft watercolor of your card is so relaxing and calming, just like a peaceful spring morning. TFS. Love the style of these pretty flowers! Beautiful card! Oh my gosh, this card is so lovely. And yes, I did just start following you on Instagram! 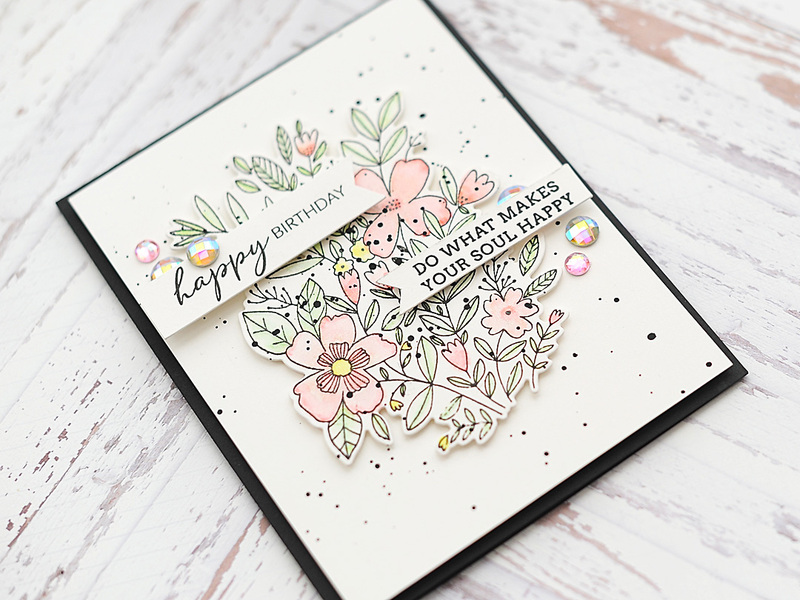 The colors are so soft, it just adds to the delicate feel of the card! Love this stamp set! Woww impresionante su diseño la verdad es que su simpleza es de una elegancia increible , muchas gracias por su inspiración !! You used one of my absolute favorite stamps. And I love what you did with it!! This is a very pretty card and those jewels are absolutely beautiful! Beautiful card ! I loved the line images and pretty colors . Great job, Lea! 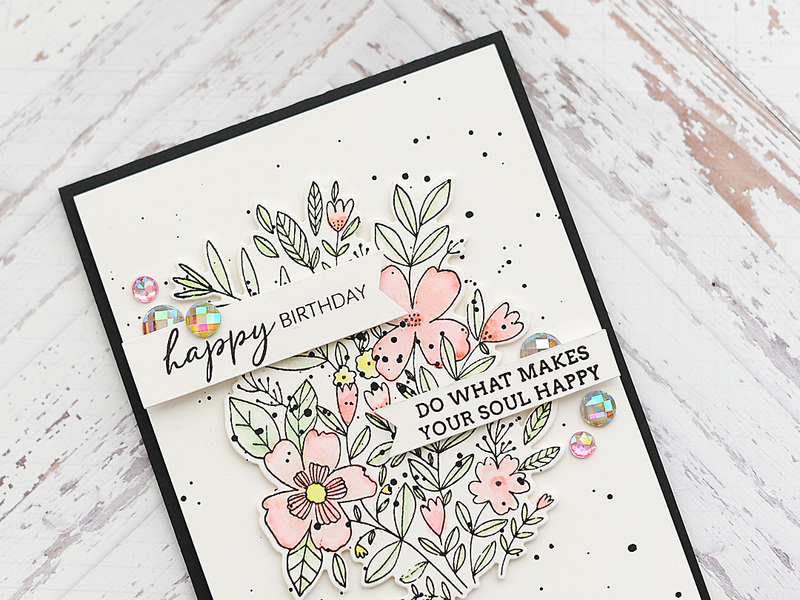 Love your soft colors on this card. Wow, I love this card so much. The softness of the colors with the black, it's stunning! Thanks for sharing. Beautiful card! I have those zig markers but I haven't mastered them yet! Absolutely in love with the pastel color pallet! Thanks for sharing!!!! The use of black and white here is really nice with the subtle pastel colours. My favorite has to be the jewel stickers. I am a sticker girls at heart. Wow! You got this just right, just beautiful! Beautiful card, with just the right amount of glitz and glam. Love the soft watercolor on your sweet card! Love the card, colors and most of all the sentiment. What a lovely card with lovely colors! Your card is so soft and delicate, I absolutely adore it! Love your card! The combination of the soft pastels with the black is stunning! The wildflower stamps plus the sentiment are beautiful. I really like what you've done here. It's so soft and pretty! I especially love how the flowers are raised up! Your card is stunning...I love it! Those flowers are so pretty and I love the softness in the coloring! They are both utterly sweet! 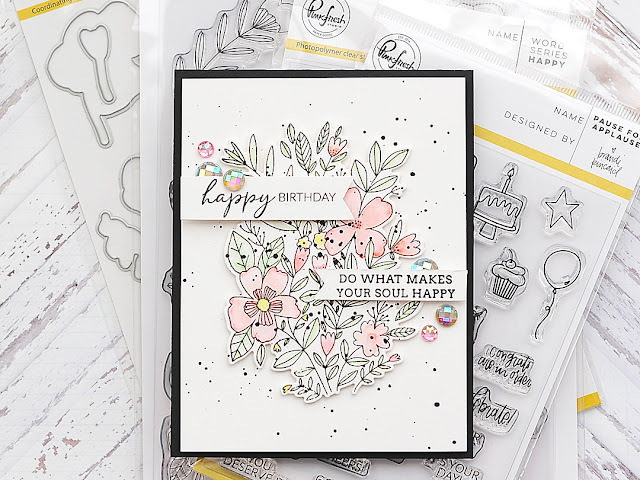 That Fleur stamp is perfection! Your jewels add such a perfect touch. Great card! Oh, this is so sweet! I love the pastels. I never trust myself with pastels, because I don't think they're sufficient, but then I see cards like this and realize I'm being ridiculous. This is so gorgeous and soft-feeling, and the gems are the perfect accompaniment because they catch all those light colors in the image. Thank you so much for sharing with us! Gorgeous!! I love the light coloring!! Oh my gosh, I LOVE your card so much that I took several screenshots to remind myself that I have to attempt to create a card just as beautiful as yours! 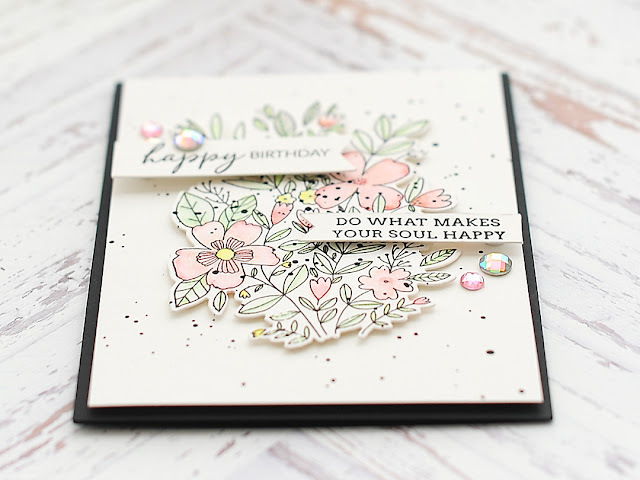 I love the plaster colors for the Fleur 1 stamp and the shimmer from wink of Stella, it’s so awesome! Love your beautiful coloring on this card, so soft. And the splatters really add to the effect! Beautiful! This is stunning Lea. The bold black outlines of the image with the pastel colours is really beautiful, I love that look. The gems are absolutely gorgeous as well. A fantastic card! What a beautiful card. 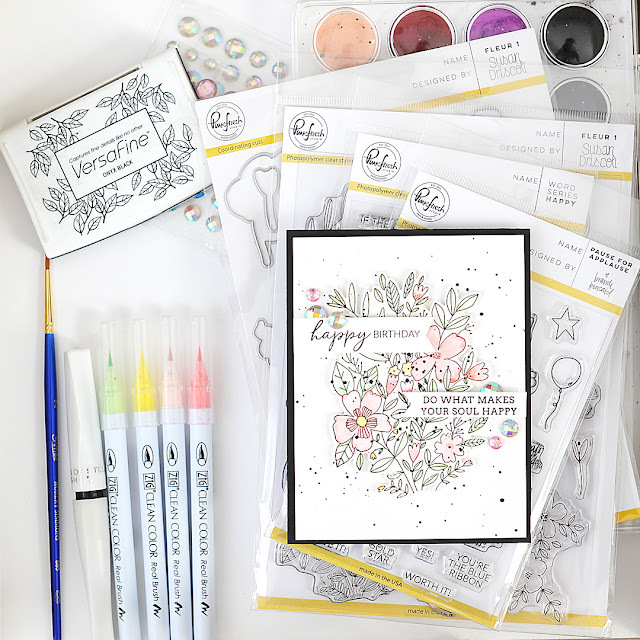 The stamp set is adorable and the colours you used are gorgeous. Backing it in black really makes it pop. Thank you for the inspiration. 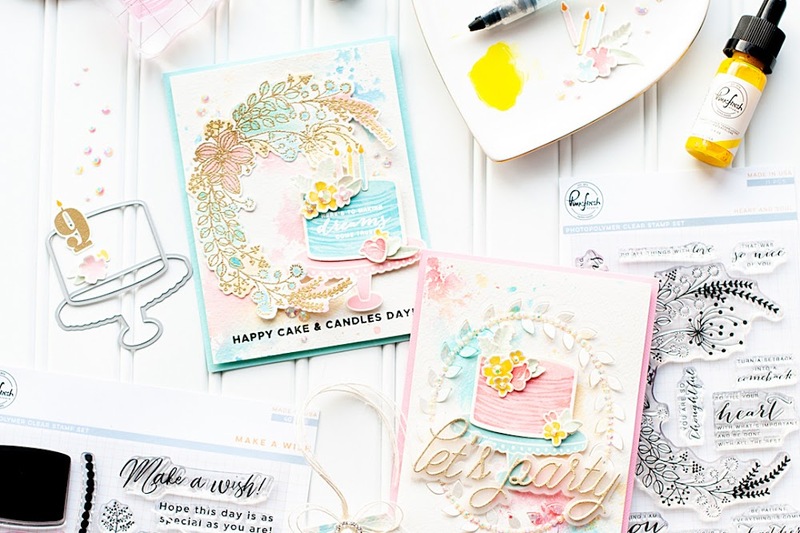 Love this soft colour palette on your card. This light hint of color on these lovely flowers is so elegant!! need to get the clean zig markers - love the colors you used. It's a simple fantastic card ! Wow ! Thanks for sharing ! Love this! 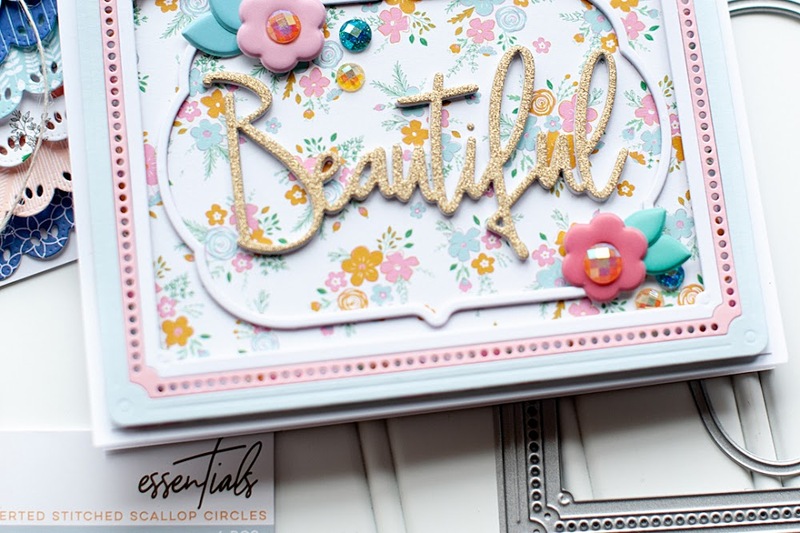 The soft colors and the tiny details! This is my favorite card so far from the hop! BEAUTIFUL!!!!!!!! That’s such a gorgeous card design !! Just beautiful!! I love the contrast of the soft watercolor with the black!